Two German researchers claim they have produced measurable amounts of thrust using a copy of NASA’s controversial EMDrive. It’s a result that has many people talking, but don’t plan your trip to the to the Alpha Centauri system just yet—the experts we spoke with are all highly skeptical of the study and its findings. Unlike conventional thrusters which need propellant, the electromagnetic drive, or EMDrive, works by converting electric power to thrust by bouncing microwaves within a closed container. But with no expulsion of propellant, there’s nothing to balance the engine’s momentum during acceleration; on paper, this device appears to violate conventional physics and laws of conservation of momentum. Hence the controversy. Critics of the EMDrive, of which there are many, say it’s all poppycock. Earlier this year, scientists at the NASA Eagleworks advanced concepts lab performed an experiment in which a copy of the engine appeared to work within a vacuum—an intriguing result that rekindled debate, while also demonstrating the engine’s potential to work in space. As a recent post by David Hambling in Wired points out, the EMDrive could reach Pluto in just 18 months, as opposed to the 9-year trip taken by New Horizons. The recent experiment by Tajmar and Fiedler was an effort to reproduce the Eagleworks results, also within vacuum conditions. “Our measurements reveal thrusts as expected from previous claims after carefully studying thermal and electromagnetic interferences,” write the authors in their study. 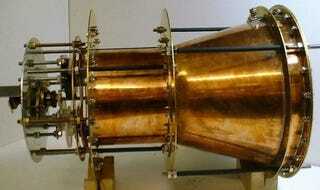 While the latest results surrounding the EmDrive are certainly interesting, there are many reasons to remain skeptical. Davis says the German researchers have fallen into an experimental pitfall by claiming to have identified all “obvious” sources of systematic artifacts that could produce the tens of micro-Newton thrust signals that they measured. He accuses them of playing “word games” through their claims that there are other possible sources of systematic artifacts that remain untested, while at the same time insisting that they measured the same level of thrust reported in previous separate experiments by Sawyer, NASA’s Harold White (at Eagleworks), and a team of Chinese scientists. Davis noticed some problems in the experiment as well. CalTech physicist Sean Carroll, who we’ve spoken to previously about the feasibility of an EMDrive, echoes Davis’ sentiments. Note: An earlier version of this article incorrectly described Q factor as an electric charge. Rather it’s a dimensionless quantity related to resonators. Specifically, in a resonator cavity such as the proposed EMDrive, Q factor provides information about the radiative leakage, linewidth, and other physical quantities of interest. Read the entire study at Aerospace Research Central: “Direct Thrust Measurements of an EMDrive and Evaluation of Possible Side-Effects”. Note: This is not a peer reviewed journal.